If you’re into following travel pages on social media, you’ve probably noticed that Thailand has become the new wave. I’ve seen so many pics of the Phi Phi Islands and Tiger Kingdom, that they were instantly added to my itinerary before I even had begun to put dates on my trip. For the past 2 years, I’ve had plans to go to Thailand, but somehow, the plans had never really come to fruition until this summer. What was supposed to be a 3-4 week trip from Dubai to New Dehli (to see the Taj Mahal before it closes to the public this summer) to Thailand to Singapore and home from Bali quickly got nixed when my summer vacation was significantly cut down due to my school district shortening this summer for us to be out of school before Memorial Day next year. But hey on a positive note, at least next year’s summer vacation will be longer. Since I was traveling with a companion that had already been to Phuket, he was placed in charge of the Phuket itinerary (which he outsourced to a tour company, men lol). Over the course of 6 days, we embarked on tours to show us the best of Phuket. The Phi Phi Islands are arguably one of the most picturesque places in the world, and while you can reach them by ferry in about 2 hours, I opted for a speedboat. Speedboats are not for those that are prone to get seasick, the faint at heart, children, or those with any ailments. And please take the Dramamine they offer you at the beginning, or you will regret it. Even though I opted to take my picture with the medium size tiger, Tiger Kingdom has tigers of all sizes for the tourists that’s willing to put on their brave face for a picture. While I was expecting there to be one tiger in the enclosure, instead I walked into a huge cage with 4, and for a second, my bravado disappeared. But being that I was with 2 men, and didn’t want to be the scary one, I sucked it up and smiled for the camera (as quickly as possible). My tiger was busy enjoying a chew toy, but I almost violated one of the golden rules, “Don’t run,” when one of his fellow compadres decided to take a stroll behind me. I got the perfect shot, and I got out the cage with haste, but it was worth it. While James Bond Island was a bit too touristy for my taste, with a vendor every half a foot, the islands that we visited on the way, Hong and Panak, were pleasant surprises. 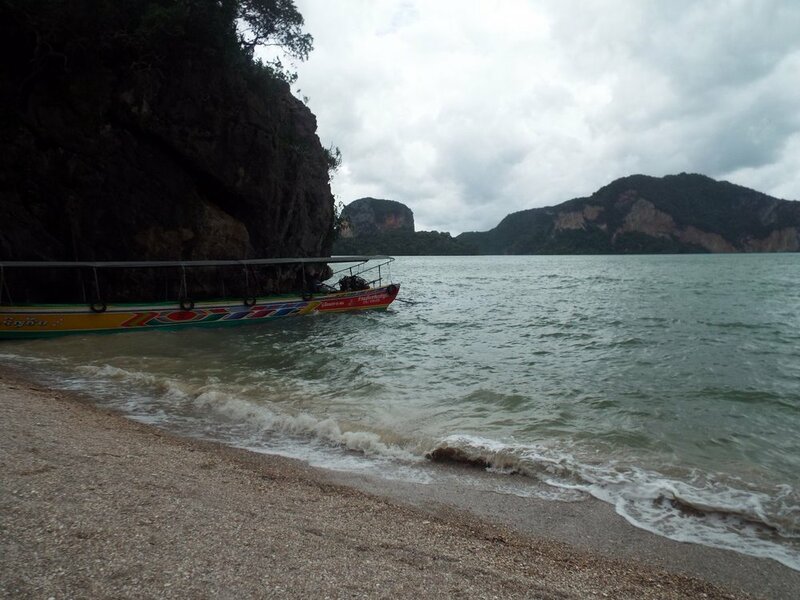 Our guides led us through dark caves in canoes to view pristine waters and untainted beaches. Since I was only expecting James Bond Island, this was a pleasant reprieve in the journey, and the best part was that I didn’t have to row the canoe myself. That would have been tragic. Btw, if you have to use the ladies room on your tour to James Bond Island, opt to use the one on board your ship. I wasn’t ready for the toilet paper-less holes in the ground that were nasty enough to make my bladder change its mind. Read more about tips to know before visiting Thailand by clicking here. I have a confession. Please don’t stone me to death. I’m a really picky food eater and often don’t venture into authentic cuisines, so I’m always prepared to be on a fruit, water, and libation diet on vacation. So imagine my surprise when I fell in love with Pad Thai and Thai Stir Fry. If I would have had some extra time on this trip, I would have taken a cooking class. If you’ve ever partied on Bourbon St in New Orleans, it’s very similar to Bangla, except Bangla is bigger and not as dirty, for lack of a better word. Bangla is a long street filled with vendors, mega clubs, and bars meaning that’s where you go to turn up into the wee hours of the night. Clubs don’t close until 4am, so it’s one hell of a lituation, spend wisely. My only advice to men is that if you’re going to take a strange women home from the club, you might want to check and make sure she’s not a lady boy. Some of them were gorgeous enough to fool me, so I could only imagine what they looked like when wearing beer/vodka goggles. Sitting on the top of the Nakkerd Hills, between Chalong and Kata, is the 167 foot tall marble statue, affectionally known as Big Buddha. After you are appropriately covered to visit this architechtural masterpiece, not only will you be able to view the Big Buddha up close and personal, you will also have access to some of the best panoramic views of Phuket city. The intricate details inside of this temple made it one of my favorite places to visit in Phuket, and let me not forget to mention, that while perusing the grounds, I also saw my first real life monk on his way to prayer service. I wanted to stop him and get a picture for the Gram, but my better judgment reminded me that would probably be super tacky, and I didn’t want to get banned from Shalom or Phuket on my first visit. There seemed to be huge markets sprinkled everywhere throughout the city. Markets are a great place to buy cheap fruits and vegis, and to sample exotic foods like shark and stingray. There are tailors on every corner that specialize in making custom suits for the low low, and most of them are on Trip Advisor, which makes selecting the one that meets your needs and budget even easier. And don’t forget, everything is negotiable. Whether it’s Patong, Karan, or one of the other many beaches sprinkled throughout Phuket, grab a fresh coconut, towel, and maybe a good read, like Punishment is Due, and relax on the beach. I’ve only recently acquired the taste buds for beer, but even still, I require light lagers versus heavy ales and am partial to Red Stripes and Heinekens. With that being said, I’ve been sucking in this beer belly for all of my pictures. 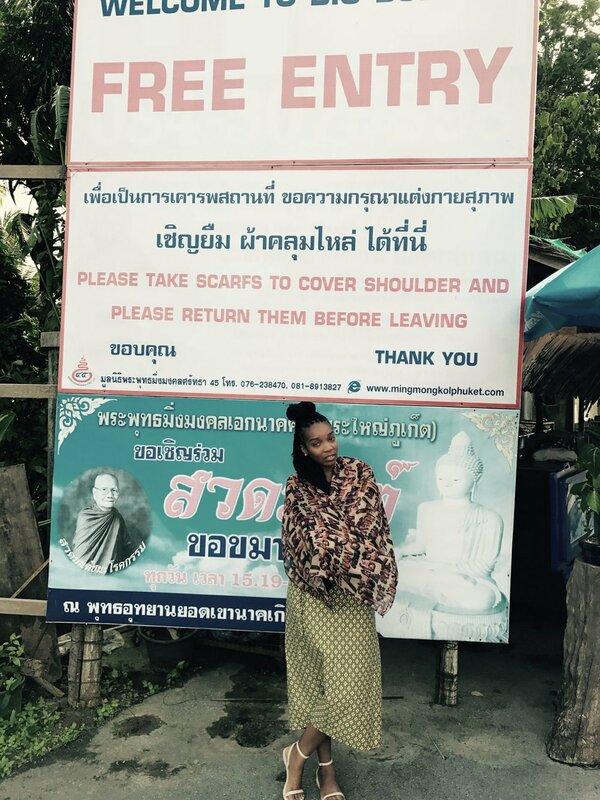 You can read about my tips to know before visiting Thailand by clicking here. Btw, you can visit and follow my IG page to view more of my travels.